I was flipping through the newspapers for competitor's advertisements as part of my daily task in the office until I came across this Samsung Galaxy mobile phones Christmas ad. 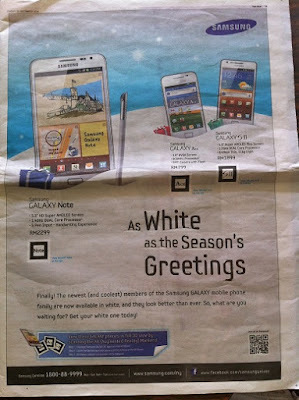 It wasn't their first insertion to promote their Galaxy series in white but this ad was their first to allow readers to view the Galaxy phones in 3D using augmented reality (AR). All you need to do is download the Samsung GALAXY 3D app from Android Market. Next, launch the app & point the phone's camera to focus on the AR marker. Ta-daa! You'll see the 3D phone appear on the screen - rotatable & scalable. Move your camera phone slightly further but keeping the 3 markers within the frame allows 3 phones to pop up magically! Using AR in thise case is a breath of fresh air from the usual, boring product ads which shout "Come buy me cuz I'm darn good". However, I thought the execution method was kind of a failure cuz you need to download the app from Android Market. For those who has an existing Android phone (excluding the Galaxy phones advertised), then it would entice them to view the AR. What about those who doesn't own Android? How is it possible to call for action from these readers to downlaoad the in order to view the 3D phone & consider visiting the shop, hence even purchasing the phone? Perhaps using a microsite to view the AR instead of the app will be a more viable option?